The AG’s opinion said conversations between law enforcement and the public are generally considered public, even if they take place inside a private residence. Washington law requires two-party consent to record private conversations, but that standard does NOT apply to public ones. Legal precedent is less clear about an officer recording a conversation between two members of the public, since no case law addresses the subject directly. But the AGO said the Washington State Supreme Court has “strongly indicated” conversations between two people are not private when they know a police officer is present. The Washington Privacy Act, RCW 9.73, does not require the consent of a law enforcement officer to use body cameras attached to police uniforms. A local collective bargaining agreement, however, might limit or prohibit such use. My opinion? I was on board with the body cameras until the AG’s Office basically gave police officers permission to circumvent the privacy rights of citizens. Look, the average citizen on the street does NOT assert their Constitutional right to refuse to speak to police officers. Nor does the average citizen refuse to grant an officer’s request to search the citizen’s home or car. Police can be very persuasive in exercising their authority. So this AG opinion said conversations between law enforcement and the public are generally considered public? Even if the conversations are NOT consensual and take place inside a private residence? Unbelievable! Bad decision. In an effort to reduce use-of-force complaints, Bellingham Police officers are now wearing cameras to record audio and video of their interactions with the public. The department is among the first to use the new equipment that now allows citizens to see crimes from an officer’s perspective. Officers are wearing two cameras — one on their chests and another mounted on collars, glasses or hats. The Bellingham Police Department has provided officers with guidelines for when they should activate the cameras. Some include traffic stops, arrests, or situations involving aggressive suspects. Police don’t need to ask for permission to record if they’re in public but they will tell you if the camera is on. However, if an officer is in a private residence he or she is required to get the homeowner’s permission to record. My opinion? Excellent decision. My hat is off to the Bellingham Police for making a pro-active decision toward this effort. 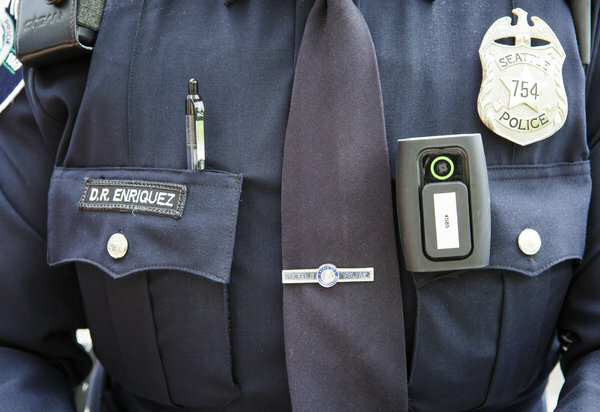 I strongly believe having body cameras makes EVERYONE — both cops and citizens — behave better. even better, the cameras should provide evidence of whether police misconduct happens in some cases. Very good. My only concern is the privacy issues. Will police will secretly turn these cameras on when searching people’s houses? And if so, can the police attempt to use the surveillance video captured by the cameras as evidence of possession of contraband/weapons? As long as police are informing citizens that conversations and searches are being recorded (and as long as the police get the citizen’s consent to search ON CAMERA) then the searches are probably not intrusive and/or violations of a citizen’s constitutional rights. We’ll see.